So…..I am always asked by friends and colleagues about the products I use, and let me tell you…..I love them all! I am a product ‘whore’ and when I find a product that is working for me I stick to it. Today I am sharing my first holy grail product with you! If it were up to me, I would have started moisturizing the day I was born. It is a quick step that should be done morning and night that will make a huge difference in the way your skin looks. The three key steps to perfect skin are cleansing, toning, and moisturizing (and of course, tons of water to keep that skin looking fresh and hydrated). Don’t skip these steps no matter how late you get home from that awesome evening out. It will make all the difference, I guarantee it! 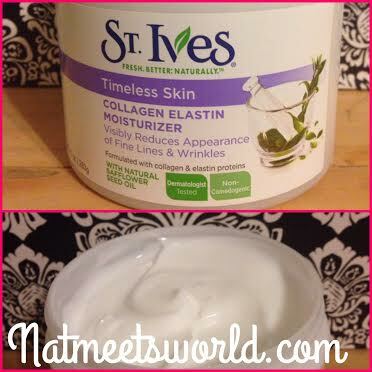 Later I will be posting my holy grail toner and cleanser, but for now, I will share my all time favorite night time moisturizer, the St. Ives Timeless Collagen Elastin Moisturizer. Now I’m only 27, but there is nothing wrong with being proactive ladies! Losing collagen and elasticity of the skin typically begins in your 40’s. If you start early, you will love the results by then. There are several things I love about this moisturizer. Check it out! very affordable! Sells around $5! This moisturizer can be used day and night, however, I prefer using a moisturizer with SPF for day.